Many rideshare drivers are surprised to learn that their auto insurance from Uber, Lyft, and other providers isn’t as complete as they thought it was, or that their private auto insurance provider can deactivate their policy just because they work for a ride-hailing service. As a rideshare driver, it’s important to account for insurance limitations. Otherwise, your income could be disrupted due to a lack of coverage. To better protect your livelihood on the road, carry rideshare insurance with King Insurance. Our comprehensive, but affordable commercial auto insurance policy for rideshare drivers fills the gaps in your current liability and collision coverage and strengthens the overall degree of coverage. We offer insurance to drivers for all the main ride-hailing companies, including the following. Make sure you’re protected with coverage from a rideshare-friendly insurance company. Contact us today for your free quote! Uber and Lyft are by far the largest rideshare companies in the United States of America. Their networks are vast, and their employees range from full-time drivers to part-time drivers who occasionally pick up passengers for extra income. Regardless of how often you drive for these companies, ride-hailing service collision insurance policies cover rideshare drivers only part of the time. The rideshare process is divided into three periods, but an Uber or Lyft insurance policy covers just two of them. As a driver, you are covered when you accept a ride and travel to the passenger (Period 2), as well as when you transport that passenger (Period 3). But Uber and Lyft provide no collision insurance during a driver’s downtime in between trips (Period 1). That means you could drop off a passenger at the destination, be in a rear-end collision five seconds later, and not be covered for the damages. And even when a Lyft or Uber accident claim is covered, the collision deductibles you have to pay are quite exorbitant, including $1,000 for Uber and $2,500 for Lyft. Our rideshare insurance solves the most common Lyft and Uber insurance issues — most other services have these or similar issues. 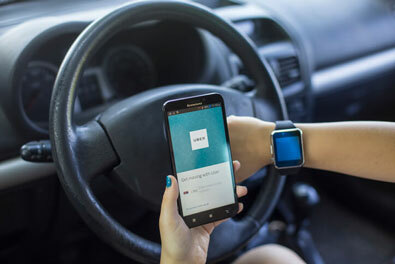 Not only does ride-hailing insurance cover all three periods of a driver’s trips, including the downtime between passengers, but it may also have a lower deductible for collisions. And if you have personal auto insurance with us, we can bundle rideshare insurance for an even better rate. Is Rideshare Insurance Available In My Area? More than half of all Americans have already used a ridesharing app, and investors anticipate the industry will grow eightfold by 2030. Despite that potential, many auto insurance companies are just waking up to the need for rideshare insurance. Some insurance providers offer coverage only in certain states, while others don’t offer it at all. King Insurance is a leader in this sector, offering competitive rates on rideshare insurance in Florida and across much of the country. Save by bundling your commercial auto policies with personal auto insurance, home insurance, or another type of insurance product. If you’re a new King Insurance customer, we make it simple to enroll in a single policy or to transition each of your plans. Browse our selection of personal insurance products for protection both on the road and off the road. Will I Need Other Insurance Products? If you’re a full-time driver for Uber or Lyft, or if driving is your primary source of income, consider bundling your rideshare insurance with a life insurance policy. Today’s gig-economy, where workers are personal contractors, is different than traditional employment that includes benefits packages with life insurance. While you’re on the road earning a living, having life insurance sets your mind at ease that you’ve put a plan in place to take care of your family and loved ones. King Insurance offers a variety of life insurance products that can be combined with other coverage policies. Contact us today for more information.